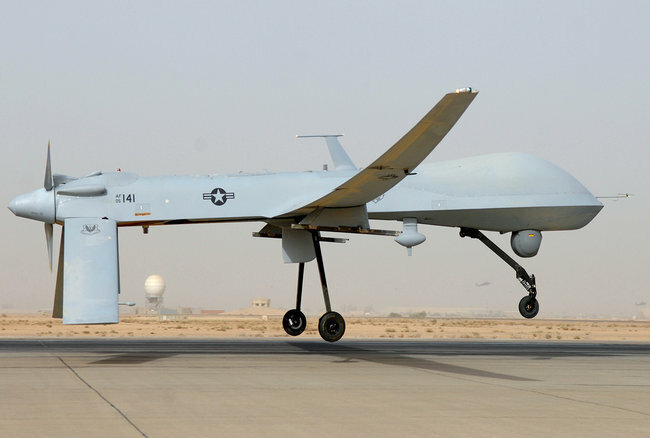 A Predator drone like the one that the Pentagon says Iran fired upon, but did not hit, last week. WASHINGTON — Iranian warplanes shot at an American military surveillance drone flying over the Persian Gulf near Iran last week, Pentagon officials disclosed Thursday. They said that the aircraft, a Predator drone, was flying in international airspace and was not hit and that the episode had prompted a strong protest to the Iranian government. The shooting, which involved two Russian-made Su-25 jets known as Frogfoots, occurred on Nov. 1 and was the first known instance of Iranian warplanes firing on an American surveillance drone. George Little, the chief Pentagon spokesman, said the Defense Department’s weeklong silence about the episode was a result of restrictions on the discussion of classified surveillance missions. He answered questions about it during a Pentagon news conference on Thursday only after it had been reported by news organizations earlier in the day. Even so, the failure to disclose a hostile encounter with Iran’s military at a time of increased international tensions over the disputed Iranian nuclear program — and five days before the American presidential election — raises questions for the Obama administration. Had the Iranian attack been disclosed before Election Day, it is likely to have been viewed in a political context — interpreted either as sign of the administration’s weakness or, conversely, as an opportunity for President Obama to demonstrate leadership. Late last year, an RQ-170 surveillance drone operated by the C.I.A. rather than the military crashed deep inside Iranian territory while on a mission that is believed to have been intended to map suspected nuclear sites. That episode came to light only after Iran bragged that it had electronically attacked the drone and guided it to a landing inside its borders. American officials said the drone had crashed after a technical malfunction. A senior administration official sought to contain any ripple effects from the episode last week, noting that it should not be viewed as a precursor to a broader military confrontation with Iran and that it should not derail potential diplomatic contacts between the two countries over the nuclear program. Mr. Little said that Iranian warplanes “fired multiple rounds” but missed the remotely guided Predator, which has a unique silhouette similar to a giant, upside-down flying spoon and is not easily confused with a piloted jet fighter. Mr. Little said that the protest was delivered to Iran through the Swiss Embassy in Tehran, which acts on behalf of American interests in Iran, and that the Defense Department would not halt surveillance missions. Officials would not speculate on whether the Iranian jets were trying to shoot down the slow-flying drone or were simply firing warning shots. The two Iranian warplanes carried 30-millimeter cannons that are intended to support ground troops and are not designed for air-to-air combat. The two planes were under the command of the Islamic Revolutionary Guards Corps, whose activities are routinely more aggressive than those of the conventional Iranian Air Force. Iran also has two navies: a traditional state force of aging big ships, and a rival one run by the Revolutionary Guards that consists of fast-attack speedboats that employ guerrilla tactics — including sailing perilously close to American warships. The last significant confrontation between the United States and the Revolutionary Guards occurred in 2008, during another time of tension, when five of its armed speedboats made aggressive maneuvers as they approached three United States Navy warships in international waters in the Strait of Hormuz. Pentagon officials said the commander of a Navy destroyer had been on the verge of issuing an order to fire on one of the speedboats, but no shots were fired. American naval officers say the Iranian state navy is for the most part more professional in its interactions with foreign warships. In the episode last week, the Predator was flying about 16 nautical miles from Iran while conducting a maritime surveillance mission east of Kuwait in the northern Persian Gulf, Mr. Little said. He emphasized that Iran’s territorial limits extend only 12 nautical miles from shore. Given the critical role of the Persian Gulf and the Strait of Hormuz in the international shipping of petroleum products, the American military conducts regular seaborne and aerial surveillance there. The Predator’s advanced sensor technology is likely to have allowed it to look toward Iran in great detail even from the distance cited by Pentagon officials. Political analysts said that the most recent episode underscored the risks that chance encounters between American and Iranian forces in the heavily militarized gulf could quickly escalate into confrontation. On Thursday, American officials also announced new sanctions that broadened the blacklist of Iranian individuals and institutions affected by laws freezing or blocking access to property and other assets. The latest entries on the list include Iran’s communications minister, Reza Taqipour; the head of the Iranian national police; and Esma’il Ahmadi Moghaddam, as well as Iran’s Ministry of Culture and Islamic Guidance, which State and Treasury Department officials accused of jamming satellite broadcasts, disrupting Internet activities, censoring news media and intimidating and detaining journalists. Two Tehran schools, Imam Hossein University and Baghyatollah Medical Sciences University, are also on the new list. Treasury officials described them as training and research centers created and run by the Revolutionary Guards. “These actions underscore the administration’s ongoing commitment to hold Iranian government officials and entities responsible for the abuses carried out against their own citizens,” Victoria Nuland, a State Department spokeswoman, said in a statement. The new sanctions coincided with reports by international rights groups that an Iranian blogger, Sattar Beheshti, who was arrested in Tehran last week, might have died during or after an interrogation in prison. Reporters Without Borders, a press freedom advocacy group, said that Mr. Beheshti, 35, had been accused by the authorities of “actions against national security on social networks and Facebook,” and that his family had been ordered to retrieve his body, bury him quickly and not talk about it. The group did not disclose the source of its information, and the details could not be immediately confirmed. Thom Shanker reported from Washington, and Rick Gladstone from New York. Mark Landler contributed reporting from Washington.